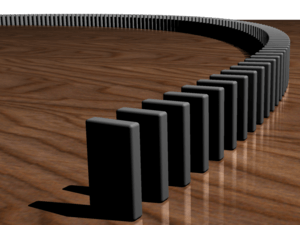 Mathematical induction can be informally illustrated by reference to the sequential effect of falling dominoes. Show that the statement is true when is 1. Show then that the statement is true for the next number, . Because it's true for 1, then it is true for 1+1 (=2, by the induction step), then it is true for 2+1 (=3), then it is true for 3+1 (=4), and so on. Hence the proof is correct. Mathematical induction is often stated with the starting value 0 (rather than 1). In fact, it will work just as well with a variety of starting values. Here is an example when the starting value is 3. The sum of the interior angles of a -sided polygon is degrees. The initial starting value is 3, and the interior angles of a triangle is degrees. Assume that the interior angles of a -sided polygon is degrees. Add on a triangle which makes the figure a -sided polygon, and that increases the count of the angles by 180 degrees degrees. Proved. There are a great many mathematical objects for which proofs by mathematical induction works. The technical term is a well-ordered set. The same idea can work to define, as well as prove. A st degree cousin is the child of a parent's th degree cousin. Mathematical induction Facts for Kids. Kiddle Encyclopedia.